Hiking? Gardening? Romping outdoors with the family dog? The activities might be wicked fun unless a truly wicked black-legged “deer” tick snags a ride on your skin and bites you. The rarely felt puncture can infuse through the wound a tick saliva backwash loaded with microbes that spread Lyme disease and other bacterial nightmares. Julia Greenspan, ND, is a doctor of naturopathy whose practice, Greenhouse Naturopathic Medicine, was for nearly a decade located in Hollis. 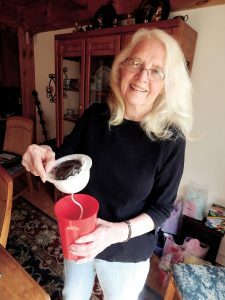 She is a fighter of Lyme disease and a survivor of it. Patients from New England and elsewhere seek her counsel and the comprehensive antibiotic, probiotic and healing treatments that oftentimes win relief. Now, Greenspan, relocated nearby to 109 Ponemah Road in Amherst, has penned an already highly acclaimed book, “Rising Above Lyme Disease; A Revolutionary Holistic Approach to Managing and Reversing Lyme Disease – And Reclaiming Your Life.” It was published in January by Fair Winds Press, of Beverly, Massachusetts. Greenspan, mother of two, is a stalwart advocate for victims. She is a member of the International Lyme and Associated Disease Society (ILADS). She is a part of he New Hampshire Association of Naturopathic Doctors. Her post within the American Association of Naturopathic Physicians has enabled her to share educational resources and peer collaborations. The “Rising Above Lyme” book, a comprehensive work of 256 pages, focuses on a whole-body approach. It is modestly priced on Amazon. Customers rate it 5 out of 5 stars, a proud testimonial, Greenspan noted. The scourge of Lyme and other tick-transmitted infections including anaplasmosis, babesiosis and Powassan Virus is widespread in the state. Governor Chris Sununu declared a Lyme Disease Awareness Month in May. He cited annually in 2018 some 200,000 to 400,000 infected in the U.S., yet a scant 35,000 reported. New Hampshire in 2016 had the second-highest incidence rate of all the states, the decree stated. Symptoms of Lyme disease, first recognized in Lyme, Connecticut, are wide ranging and commonly misdiagnosed by traditional medics. Joint pain, floaters in the field of vision and unexplained rashes, dizziness and a creeping sensation on the skin are indicators that scream Lyme to a Lyme-fluent practitioner. Many more symptoms, in addition to methods for correct tick removal, tick-identification guidelines, details on tick testing laboratory services and more can be found on Greenspan’s website (greenhousemedicine.com). The practice Greenspan conducts with associate Destiny Green, ND, is supported by a staff well attuned to the sensitivities of those who previously were told, “It’s all in your head.” Greenspan’s family practice and environmental medicine practice also are well patronized. Greenspan asks, “How do we rise above Lyme disease?” Her answer includes becoming educated about what to expect in the course of diagnosis and treatment, and learning how to advocate for oneself. Information on “Rising Above Lyme” and Greenhouse Naturopathic Medicine can be had by calling 249-5771 or online: greenhousemedicine.com.